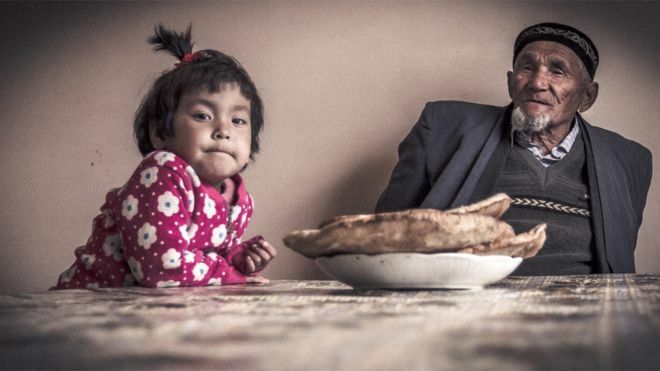 “The history of the Karakalpak people starts with the sea,” says the former fisherman. “Fishing was the first thing fathers taught their sons”. Moynaq lies at the heart of Karakalpakstan, a semi-autonomous republic within Uzbekistan. 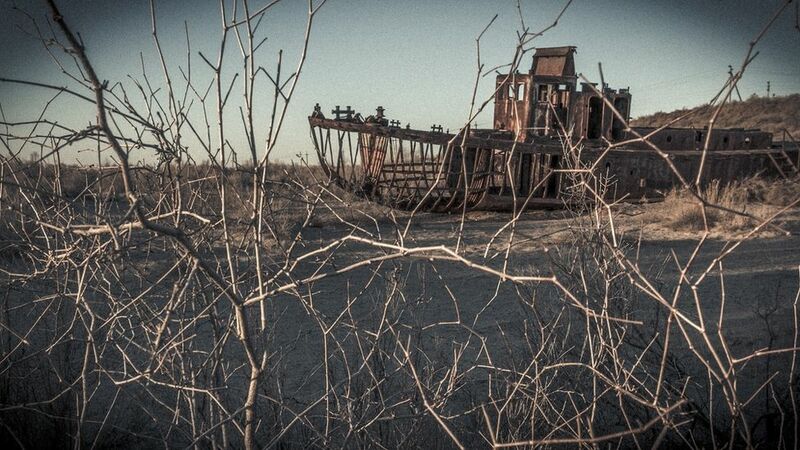 In its heyday, this is where 98% of Uzbekistan’s fish came from. “I was the first Muslim captain in Moynaq and my ship was the Volga. Captains were usually ethnic Russians,” Almas says proudly. 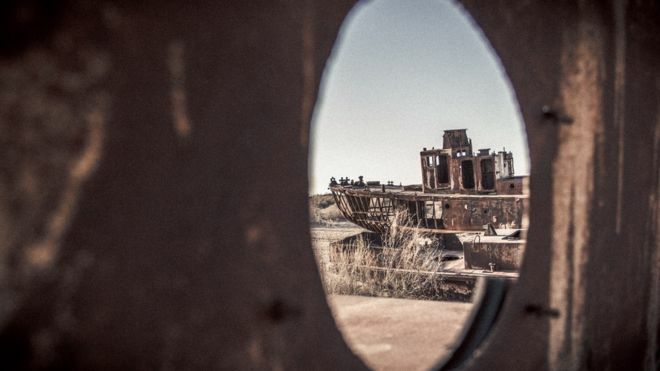 “There were 250 ships here. I used to catch 600-700 kilos of fish every day. Now there is no sea”. “Fish stocks went down and in the end all we caught were dead fish. Now young people have to leave for other countries in search of jobs”. 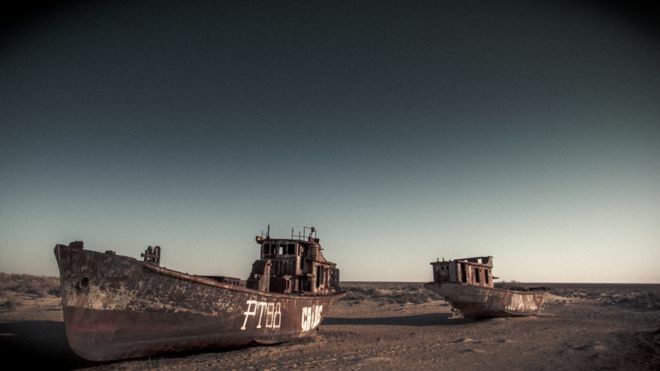 The Aral Sea has shrunk to 10% of its former size – an area of water as big as Ireland has been lost. But it’s not just a way of life that has been affected. The captain waves his hands above his head: “It’s not like before, the weather is bad, there’s all this dust in the air”. When Dr Yuldashbay Dosimov first came to work at Moynaq’s hospital in the 1980s the shoreline was already 20km (12 miles) away. He remembers the illnesses that were specific to the region: “Respiratory problems, tuberculosis and kidney problems were widespread. Until recently, many children died of diarrhoea”. 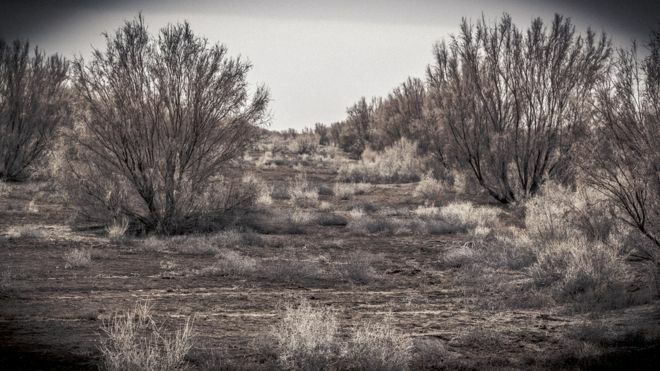 The Soviet authorities who expanded Uzbekistan and Kazakhstan’s cotton industry did not foresee that herbicides and pesticides from their new plantations would run off into the rivers around them and end up in the Aral Sea. When they identified the problem, they started work on a solution. And it’s a solution that Dr Dosimov hopes will radically improve the wellbeing of the Karakalpak people. “They have to lessen the impact of the dried up sea on people’s health and that’s why they are planting saxaul trees”. “No matter if it rains or shines, we have two weeks to plant a hectare (2.4 acres),” says one of the men. “It’s been cold and rainy lately, but we won’t leave until we reach our goal”. “One fully grown saxaul tree can fix up to 10 tonnes of soil around its roots,” explains Orazbay Allanazarov, a forestation specialist. 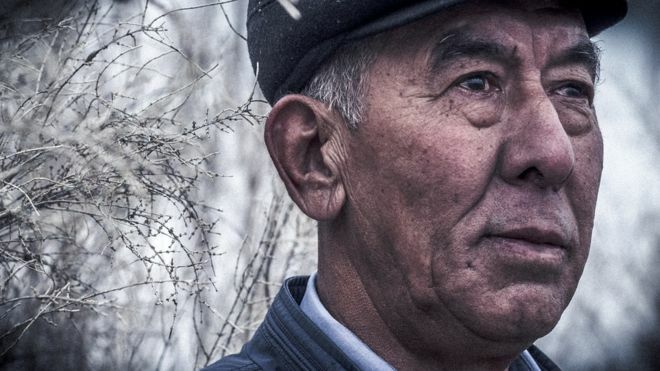 Image captionOrazbay Allanazarov believes the humble saxaul tree can help the Karakalpak people of Uzbekistan. “Here almost one in two trees has survived. This is good.” He doesn’t hide his excitement as he strokes the branch of one white-grey shrub that stands two and a half metres high. It’s a long term project – this row of saxauls was planted five years ago. 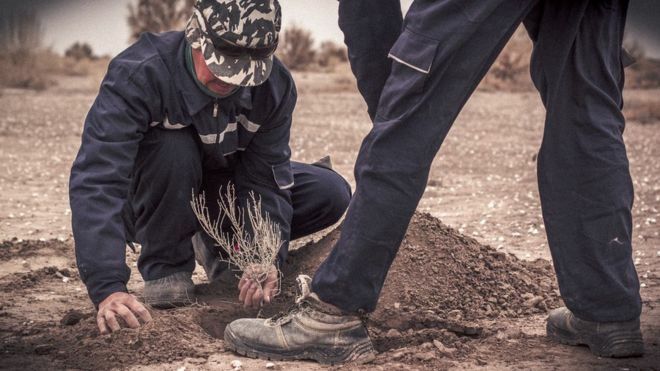 “We chose saxaul trees because they can survive in the dry and salty soil,” he says. “We are slow,” admits Allanazarov. “We need to speed up the process. But for this we need more money, more foreign investment”. But at least now there is some hope that the Karakalpak people’s quality of life can be improved – a lifetime after a decision was made to choose cotton over fish. 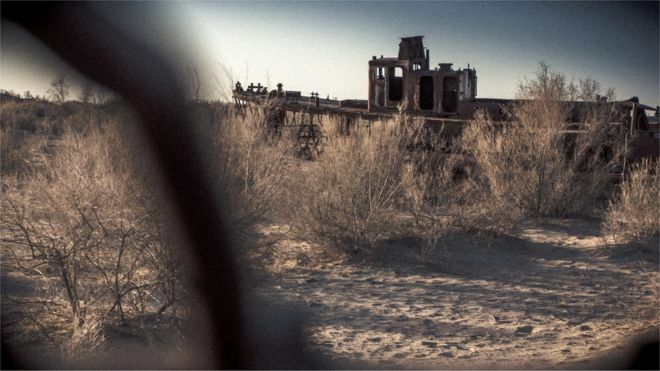 This entry was posted in Europe, History, Travel, World and tagged Aral Sea, Karakalpak people, Kazakstan, Uzbekistan by rolyred. Bookmark the permalink.